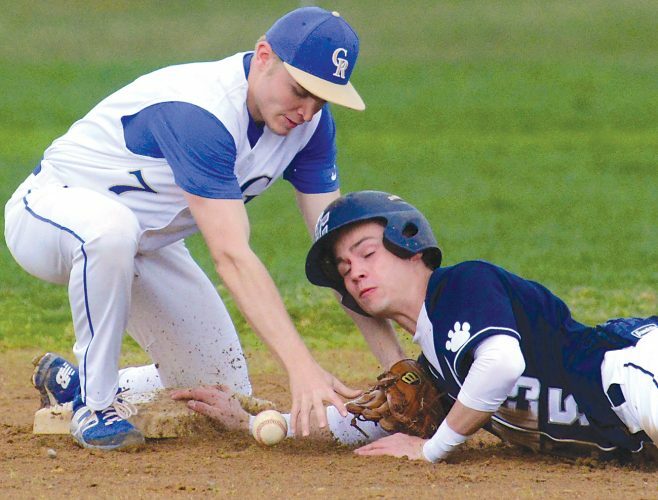 Mirror photo by Gary M. Baranec Curve shortsthop Cole Tucker gets Akron’s Sam Haggerty out at second base and fires to first for a double play on Friday at PNG Field. The Curve have lost a bunch of crushing games in the late innings this season, but typically have bounced back and responded in impressive fashion the next day. Friday night, they held on to win a game that looked like it was slipping away, which can only serve as a confidence boost for the club. “It didn’t have the feeling tonight of, ‘Here we go again,'” Curve manager Michael Ryan said. Altoona scored all six of its runs in the fourth inning and held on to beat Akron, 6-4, before 5,015 fans at Peoples Natural Gas Field. This weekend’s series pits the top two teams in the Western Division, and the Curve pulled within five games of the RubberDucks while holding a 2¢-game lead over Harrisburg for the final playoff spot. Will Craig and Logan Hill each had a two-run single, and Arden Pabst smacked a two-run homer to cap the six-run fourth inning. But the RubberDucks have the league’s best record (65-46) for a reason, and their ability to come back, coupled with the Curve bullpen’s struggles made it clear that the game wasn’t over by any means. Sure enough, Akron closed within 6-4 in the eighth inning and had the tying runs in scoring position with two outs. Ryan turned to Matt Eckelman to get out of the jam, and the reliever did so with just one pitch as he retired Daniel Salters on a fly ball. There was no drama at all in the ninth inning as Eckelman cruised with a couple of strikeouts and a groundout to earn his fourth save. “That’s what I look for. I love coming in and closing games, and that’s what I find the most fun pitching-wise,” Eckelman said. The Curve lost on a rainy night at Harrisburg on Thursday, squandering a 3-2 ninth-inning lead, but they didn’t suffer a repeat letdown in the late innings Friday. “It’s big, especially from what happened (Thursday) night in Harrisburg,” Ryan said. “It’s just the way they responded. Eckelman saved six games at high-A Bradenton before coming up to the Curve, so he now has 10 for the season and is comfortable in that role. He will get more opportunities to close, and he believes the bullpen’s issues can be corrected. Eduardo Vera (5-3) got the win for the Curve, giving up three runs on seven hits over 5ª innings with five strikeouts and three walks. Kyle Dowdy (3-5) took the loss for Akron. Key player: 1B Will Craig and LF Logan Hill each had two hits and two RBIs. Key play: The Curve scored six times in the fourth inning, and RHP Matt Eckelman stranded the tying runs in scoring position in the eighth inning. Key stat: The Curve are five games behind Akron and 2 ¢ ahead of third-place Harrisburg. Bottom 4th: Tucker singled, Hayes singled, both scored on Craig single (2-0); Reynolds walked, scored along with Craig on Hill single (4-0); Pabst two-run homer scored Hill (6-0). Top 5th: Salters solo homer (6-1). Top 6th: Sever singled, scored on Marabell sacrifice fly (6-2); Rodriguez doubled, scored on Tom single (6-3). Top 8th: Rodriguez singled, scored on Mathias groundout (6-4). 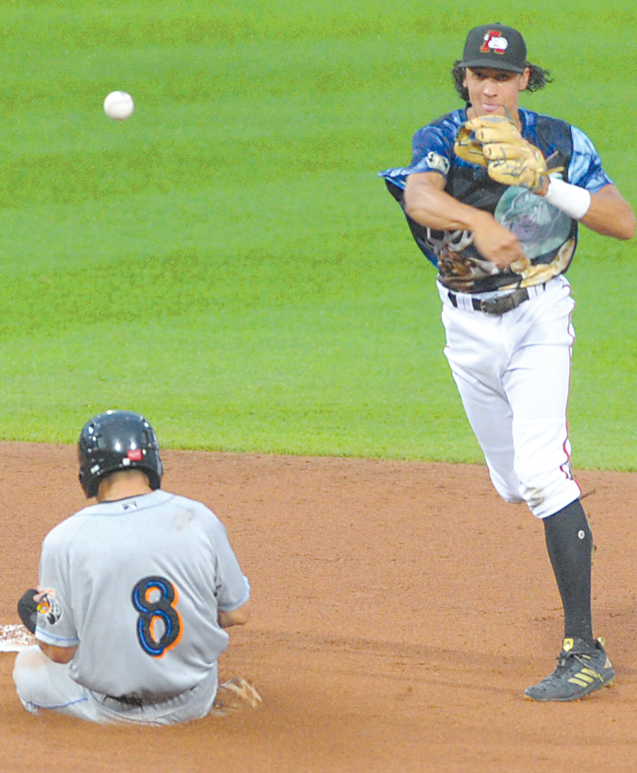 LEADING OFF: The Curve wore some highly unusual jerseys Friday night — blue tops with three deer heads and a moon. They were three white-tailed deer, the state animal of Pennsylvania. They were auctioned off after the game. Let’s just say they weren’t too popular with the members of the team. SAFE AT FIRST: The Curve once again are nine games over .500, matching their season high. STEALING SECOND: 1B Will Craig is up to 88 RBIs, just 18 shy of Adam Hyzdu’s franchise record. ROUNDING THIRD: RHP Nick Burdi’s MLB rehab assignment with the Curve ended Friday. HEADING HOME: INF Alfredo Reyes has been promoted to Triple-A Indianapolis, and RHP Pedro Vasquez was activated off the disabled list.